Jah 9's new album, New Name, is a must listen. 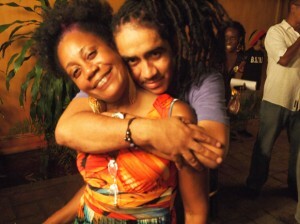 Big Up Radio's Raka Polson was there for the album launch in Kingston, JA and gives the album a high 5. The album is now available on iTunes. Redbones Blues Café was anything but blue last Tuesday February 26 as cameras flashed on glittering red, gold and green and joyful faces who turned out for Jah 9's album launch of New Name (Rory Stone Love Records). For the ocassion Jah9 was supported by a capacity crowd including album producer Rory from Stone Love, an all-star cast of musicians and a who's who of the Jamaican music industry including Elise Kelly, the night's emcee and the Queen of Mid Morning radio on Irie FM, as well as Chronixx, Kabaka Pyramid, Protoje, Stone Love founder Wee Powe, Storm Salter, Nadine Sutherland, Marcia Griffiths, Mikey Bennet, Mutabaruka and many more. The evenings programme started with Tamara Thomas who performed libations (a ritual pouring of a liquid as an offering to a god or spirit or in memory of those who have died) before industry veteran Mikey Bennett stepped to the stage to give his blessing and took the time to pay special homage to producer and Stone member Rory who helped to make this album a reality. Rory’s commitment and dedication to this album and promoting the positivity of this type of music in Jamaica shows his patriotism and love for the music. When Jah9, the petite young lady neatly clad in black and gold, with locks down took to the stage she could do no wrong. At this time the venue was packed, ears and eyes tuned as she blessed the microphone for the first time that night. Flagman for the evening was one of her brother in the business, Chronixx , who did his job well and without breaking stride. Jah 9's vocal were as bright as the moon which permeated the sky. 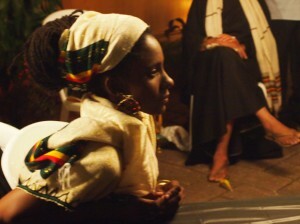 Jah9 (L) getting in the zone. Elise Kelly and Rory (R) feeling the vibes. What could be better than a live band, great backup singers, strong vocals, outdoors and a strong message? The crowd sang, rocked, whistled and did everything to prove they were with her 100%, the performance never dropped as she performed songs from the album. In her uniquely profound style she gave the audience some advice “your only limitation is your imagination which means you have no limitation”. Crowd favorites for the night were "Avacoado" and "Mr. Right". Jah9 declared that she wasn’t going to talk about heart break but she would talk about the good things that men do. The men couldn’t hide the smiles as she hit the lines “so confident I can tell from his posture and so intelligent it’s like he’s emulating light ” of her song Mr. Right. Grabbing shades and removing her slippers, tying her hair up now transformed into a roots bad girl swag, Jah9 said she “had to sing a song fi mi kuntry man dem”. The men started to blush and the ladies moved to the sweet melodies that also had them smiling as if reminiscing and singing punch lines “Avacado”, “Right Remedy” and “Size 14”. 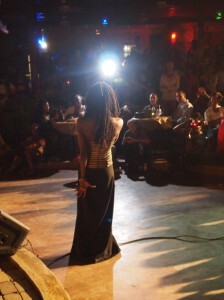 Jah9 (L) in the spotlight. 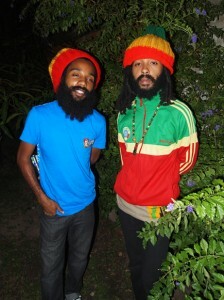 Yaadcore and Protoje (R) show their support. Her love for “kuntry men” once again took center stage as Protoje took to the stage in his usual unassuming yet confident way performing their song, "After I’m Gone". The crowd went into frenzy as the preferred beverages of the night mixed with the melodies, sweet aroma and the august breeze made everything right. 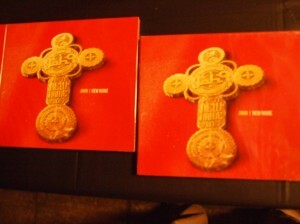 The New Name album launch involved the support and early performances and commentary by Dr. Dennis Howard who shared his review of “New Name” in which he referred to the album as “musical tonic…fresh and dynamic" and ended by saying “(Jah9) is seen as someone who will break down barriers”. Others who blessed the stage early were keynote speaker and University of West Indies lecturer Dr. K'adamawe K'nife, Omega Vibrations a female dub poetry group that got patrons pumped, and Edna Manley graduates Kimone Ennis and Tamara Thomas who created a stir with their mystical dance movements. 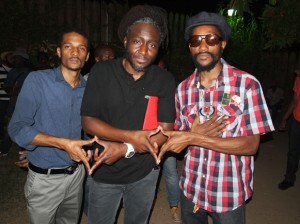 Abi Hoilett, Neil Diamond, Kabaka Pyramid (L) at the launch. 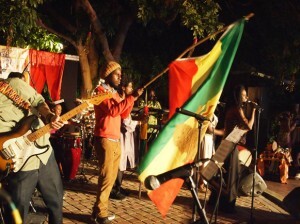 Chronixx (R) shows his support on stage.